Nick Zinner of the Yeah, Yeah, Yeahs is one of my favourite guitarists around at the moment. All his parts are simple but interesting and very individual. It almost makes it worth putting up with that screaming harridan of a singer. This riff is very staccato. 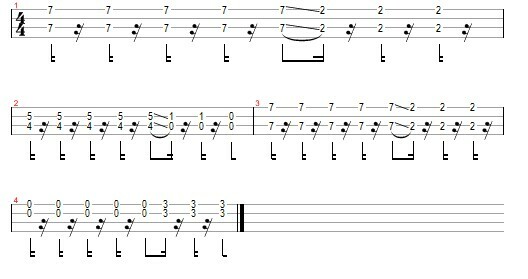 You can produce this by releasing the pressure with your fretting hand shortly after you’ve played the note and, particularly on the open notes, muting the strings with your picking hand.